I have some information on line; but this is not a direct line for me. Kent Pusser had just sent me an email to verify some information so I was adding to what I had online and came across this data. I have updated my online data to include anything new that I came across so it should show in rootsweb and ancestry within the next couple of days. 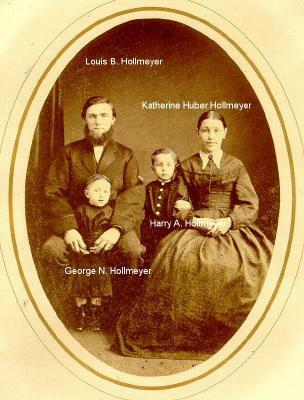 My Miller family connects with the Purser/Pusser family; my grgrgr-grandmother was a Metcalf and her mother was a Purser which connects to John Purser & Susannah "Beloved" Cuthbertson. Their son David's son, Pryor Green's son Green Purser married Sarah Valary Holland which connects to your data. I appreciate your telling me about Mary J. Holland. Do you know any more? What is your connection to the Hollands and specifically to Jesse J. Holland? He was quite a character. Are you interested in knowing more? 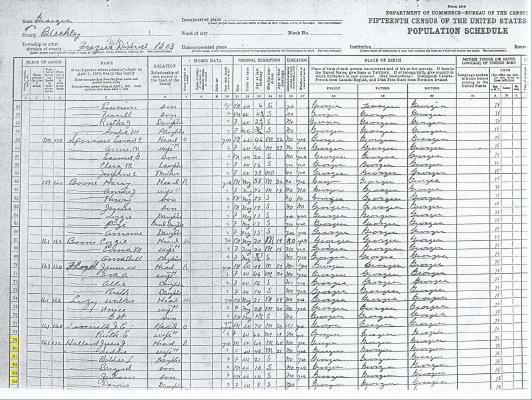 [S60] 1910 Census;, Name hard to read. Note* June 2002� Note from Annette Kaplan:Miss Siddie Bradley was a neighbor of ours who lived about a mile and a half from mama and Papa. Grandpa Holland married her in his old age while living with us. They were not married for very long when he came back to stay with Mama and Papa where he stayed until the time of his death. Her maiden name was Holland, but don't know who her father was. [S518] 1930 Census;, She is now married to J.J. Holland. [S567] Barry Holland, "Barry Holland," e-mail to Margot Woodrough, 2005. CENSUS1870* 1870� In 1870 at 1870, Pulaski County, GA, 1870 Census shows occupation as "planter" with total value of land and property $1,600. Household has Sarah A. Taylor 50 (possibly this is John Holland's wife (and mother of William) who remarried and is widowed, however it could also be his wife's mother under same circumstances. Also shown is Ludwell H. Odum and Elbert Coley 9 and Juda Holland 78. Elbert and Juda are black. [S59] 1900 Census;, On Ancestry.com its page 18 of Dist 387 Trippville. Vic Jeter spelled it Holland but i believe he was wrong. Death* 19 January 1946� She is buried at Spring Grove Cemetery Sec. 113, Lot 6. 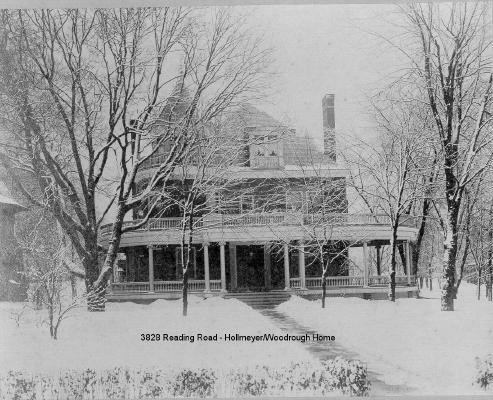 At the time of her death she was living in her parents home at 3828 Reading Road. [S59] 1900 Census;, Soundex, Vol 70, sheet 3 line 10 ED 271. [S59] 1900 Census;, Enumeration date June 8, vol. 69 ED 229, sheet 4 line 84. [S59] 1900 Census;, Enumeration date 6-11-1900 soundex code H456 date read April, 1983. [S9] 1900 unknown record type, unknown repository address. Birth* 7 January 1880� Laura Alma Hollmeyer was born on 7 January 1880 at Newport, Cambell County, KY.
Mrs. Julia Wilson Woodrough received Thursday afternoon at her home, Hale Avenue, Avondale, in honor of her son's bride, Mrs. James Woodrough (Laura Hollmeyer) The decorations in the hall were white chrysanthemums, and in the library yellow Chrysanthemums, while the dining room, like the parlor, was in pink - roses and smilax forming the decorations. Mrs. Julia Woodrough wore a handsome toilet of lavender crepe de chine with violets at her corsage. Mrs. James Woodrough wore her wedding gown and carried pink roses. 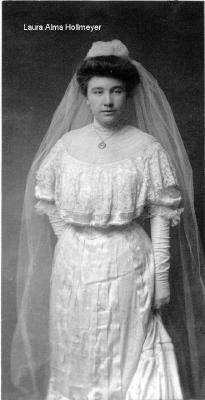 Mrs. Hollmeyer, the bride's mother, wore black satin and assisted in recieving. Miss Riedesel, Miss Andrews, Miss Kinsley and Miss Teitig, who were Mrs. Woodrough's bridesmaids, wore their pink taffeta gowns made in 1830 style and carried pink rosebuds. They were also in the receiving line. 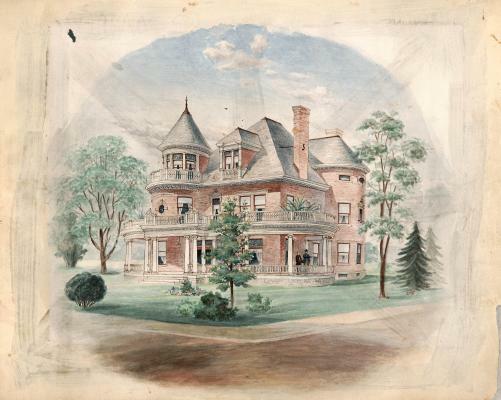 Assisting throughout the various rooms were the Misses Mougey, Miss Stell Goss, Miss Clara Bartlett, Mrs. Alber Bell, and Mrs. Edmund Townsend; File contains Bride's wedding book with original invitation, pictures and newspaper clippings. 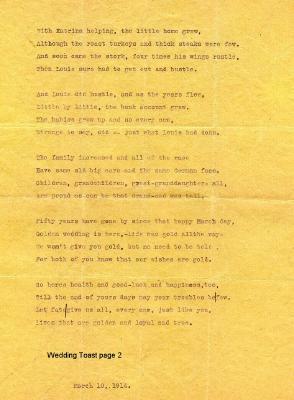 She had a note of congratulations from Luttia M. Clemson who lived in Tarpon Springs Florida. She said, "Grandmother better and joins me in congratulations on your wedding". 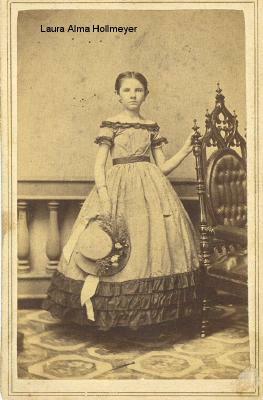 MARRIAGE* 1864� He married Catherine A. Huber, daughter of William Huber and Sophia Engel, in 1864 at Cincinnati, Hamilton County, OH. MARRIAGE* 1864� He married Catherine A. Huber, daughter of William Huber and Sophia Engel, in 1864 at Cincinnati, OH. He changed his name when he came to America. 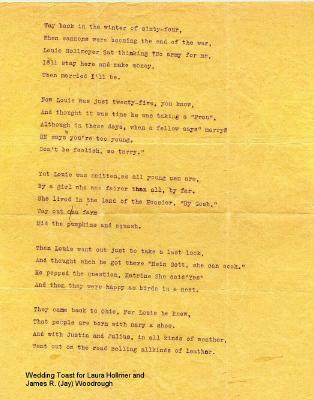 [S564] Bob Hollmeyer, "Hollmeyer message," e-mail to Margot Woodrough.